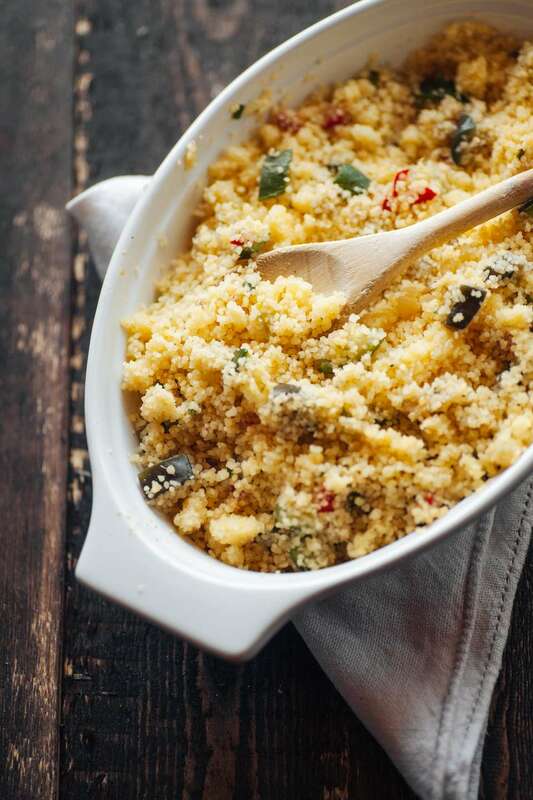 This outstanding recipe for classic Casablanca-style couscous features steamed couscous piled high with stewed meat and vegetables. (You can omit the meat for a vegetarian couscous.) Feel free to vary the vegetables to your family's preferences, but try to include a full variety to achieve an authentically flavored sauce. It's become increasingly popular in recent years to garnish this dish with a generous topping of tfaya, a caramelized onion and raisin mixture that can also adorn couscous all on its own. If you've never used a couscoussier, a traditional steamer used to make couscous, it is not difficult to learn ​how to use. Just be prepared to steam the couscous three times, about 15 minutes each. If you choose to use chicken as the meat, an organic, free-range bird works best due to the long cooking time. Mix the meat, onion, tomatoes, oil, and spices in the bottom of a couscoussier. Cook uncovered over medium to medium-high heat, stirring occasionally, for about 15 minutes, or until the meat is browned and the onions and tomatoes have formed a thick sauce. Work in 1 cup of water in the same manner, using your hands to evenly distribute the liquid into the couscous. Transfer the couscous to the oiled steamer basket. Add the cabbage to the meat mixture, and place the steamer basket on top (seal the joint if necessary). Once you see steam rising from the couscous, steam the couscous for 15 minutes. Pour the couscous back into the large bowl and break it apart. When the couscous has cooled enough to handle, gradually work in 2 cups of water and 1 tablespoon of salt with your hands. Again, toss the couscous and rub it between your palms to break up any balls or clumps. Transfer the couscous back into the steamer, taking care not to pack or compress the couscous. Add the turnips, carrots, tomatoes, onions, and fava beans (if using) to the pot. Place the steamer basket on top of the couscoussier (seal the joint if necessary), and steam the couscous a second time for 15 minutes, timing from when you see the steam rising from the couscous. Once the couscous has steamed for 15 to 20 minutes, turn it out into the large bowl again. Break it apart, and let cool a few minutes. Gradually work 3 cups of water into the couscous with your hands, tossing it and rubbing the grains between your palms. Taste the couscous, and add a little salt if desired. Transfer about half of the couscous to the steamer basket. Again, try to handle the couscous lightly and avoid packing it into the steamer. When you see the steam rise through the couscous, carefully add the remaining couscous to the steamer. Continue cooking, watching for the steam to rise from the couscous. Allow the couscous to steam for a full 15 to 20 minutes. At this point, all of the vegetables should be cooked. Test the vegetables to be sure, cooking longer if necessary. Taste the broth—it should be salty and peppery—and adjust the seasoning if desired. Empty the couscous into the large bowl, and break it apart. Mix in the 2 tablespoons of butter with 2 ladles of broth. To serve the couscous, shape it into a mound with a well in the center. Put the meat into the well, and arrange the vegetables on top and all around. Distribute the broth evenly over the couscous and vegetables, reserving one or two bowlfuls to offer on the side for those who prefer more. If you see steam escaping from between the basket and couscoussier, you'll need to seal the joint. You can do this in several ways: wrap and tie a long piece of damp cloth over the joint, tightly wrap a long piece of kitchen plastic film around the joint, or wrap and drape a long piece of kitchen plastic film onto the rim of the couscoussier, and then place the basket on top.